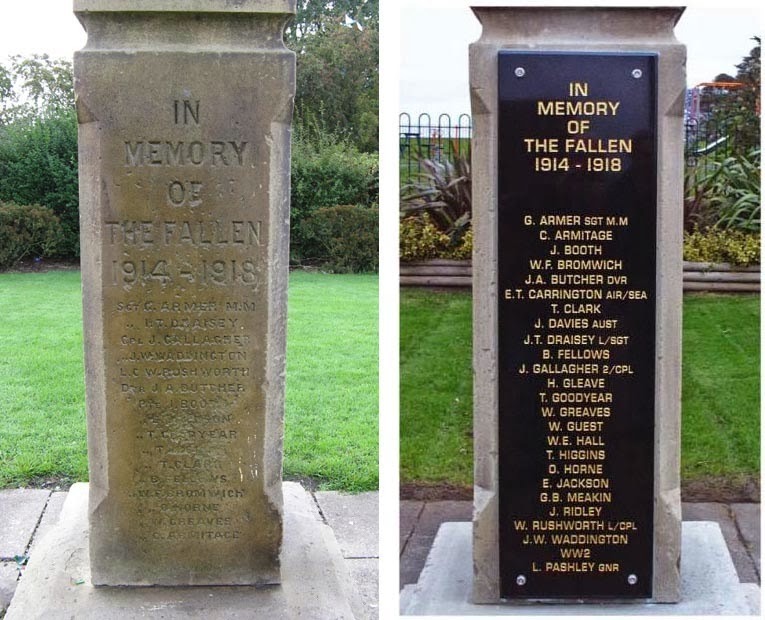 The Spring 2014 issue of Memories of Barnsley includes two articles very relevant to the Barnsley War Memorials Project. The magazine has produced articles about Barnsley soldiers from its earliest issues, and a search through the back numbers for information on the First World War, recruitment and individual soldiers is well worth the effort. Back issues can be bought through their website and a full set can be browsed in Barnsley Archives. Of particular interest this month is a piece by Brian Elliott on 'local miners who fought the war underground', digging tunnels beneath the enemy lines which would then be stuffed full of explosives and blown up as part of the opening moves of a battle. Names mentioned include William Hackett from Nottingham, Denaby and Mexborough who served in the Royal Engineers and was awarded a posthumous VC. More information on him can be found here. 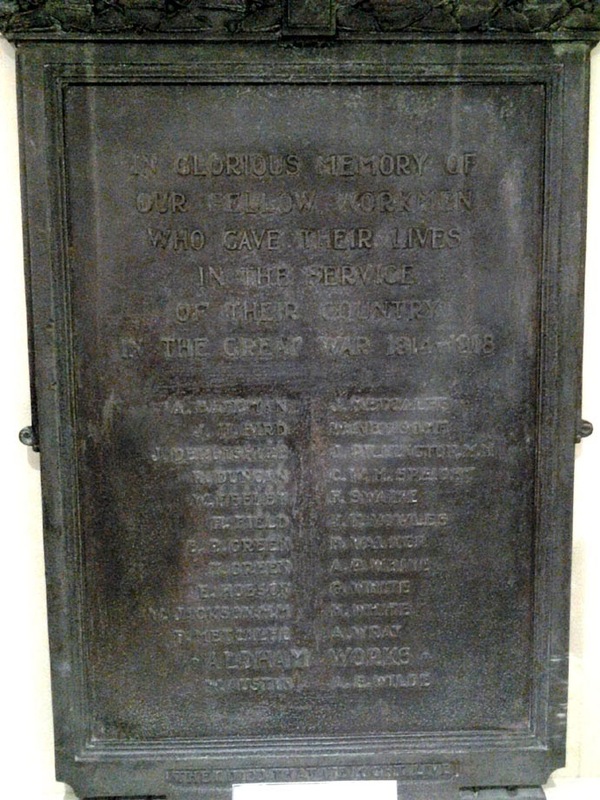 Also mentioned are Corporal William Clarke of Wombwell who won a Distinguished Conduct Medal before being killed in 1915 (he is remembered on the Cortonwood War Memorial), Lance Corporal Samson Scargill of Wombwell who won the Military Medal in 1916 and Albert Shepherd of Royston who won our only Barnsley WW1 VC (remembered by a special plaque on the Royston War Memorial). Later in the issue is a very detailed piece by Mark Green which tells the story of Benjamin Riley Green from Old Mill Lane in Barnsley. Benjamin worked at Redfearn Brothers Glassworks before enlisting and is remembered on their war memorial tablet. 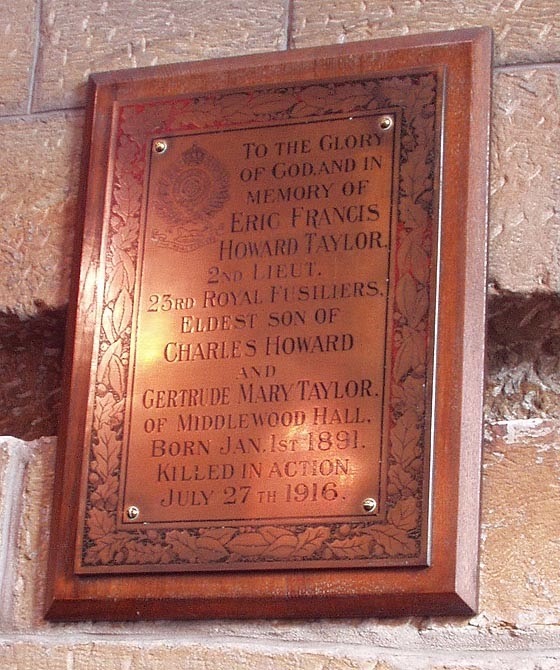 Mark follows Benjamin's story from his schooldays through his work at Redfearn's, marriage to Alice Woodcock and enlistment in the 14th York and Lancaster regiment (2nd Barnsley Pals) in April 1915. 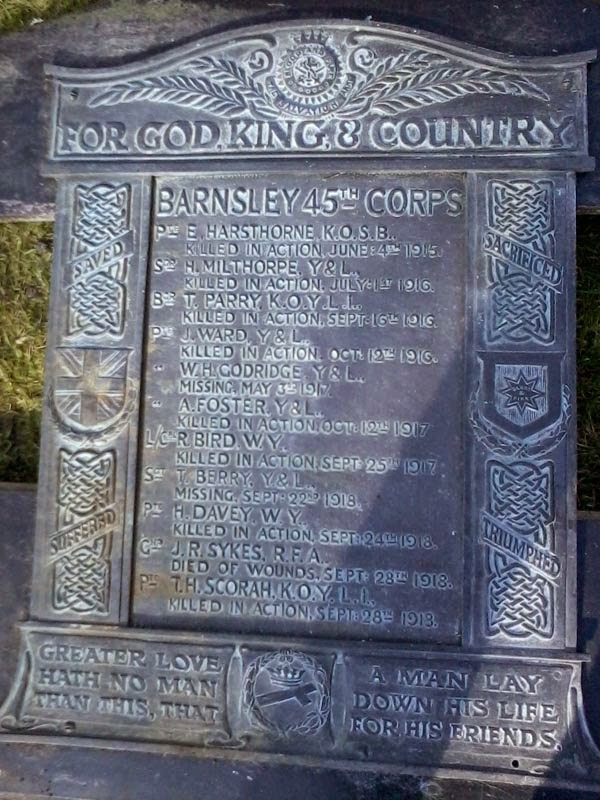 Benjamin was sadly killed on the first day of the Battle of the Somme, 1 July 1916, along with many other Barnsley men. The story concludes with a poignant image of Benjamin's gravestone in France. 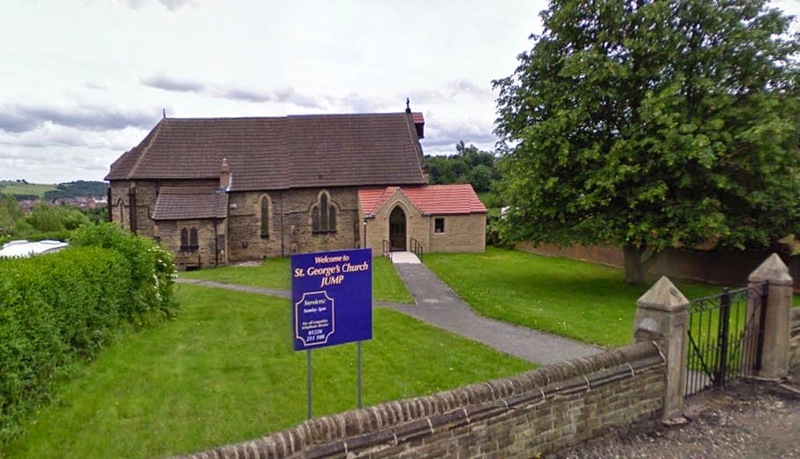 Benjamin was also remembered on the memorial tablet in St John's Church, Barebones, Barnsley, which is where he married in 1914. Unfortunately this memorial no longer exists, however a list of names has been transcribed from a contemporary newspaper cutting reporting its unveiling in 1921. We look forward to many more stories about Barnsley soldiers in the issues of Memories of Barnsley over the next few years. Recommended! Designed by Jim Milner, Lettering and Artwork by Elizabeth Stocker. Stone donated by Roger Hunt of Hillside Quarry, Thurlstone. 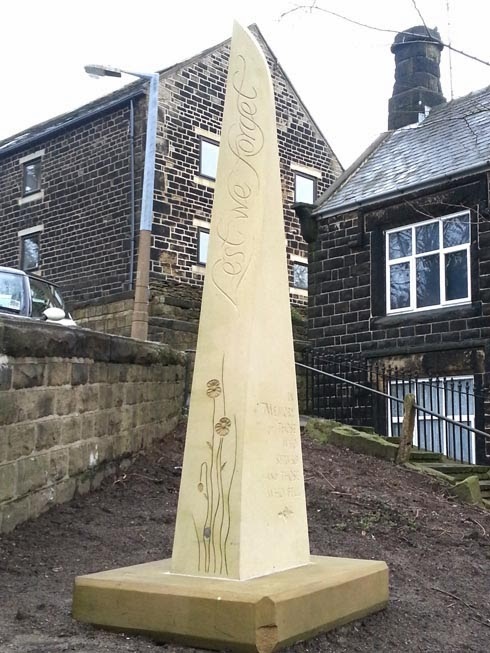 This memorial was completed in April 2013 and initially planned to be installed in May, however there was a delay and it was finally installed on 18th December 2013. The chip on the corner of the base caused during installation is due to be repaired 'when the weather improves'. Thanks to Elizabeth Stocker for this information. 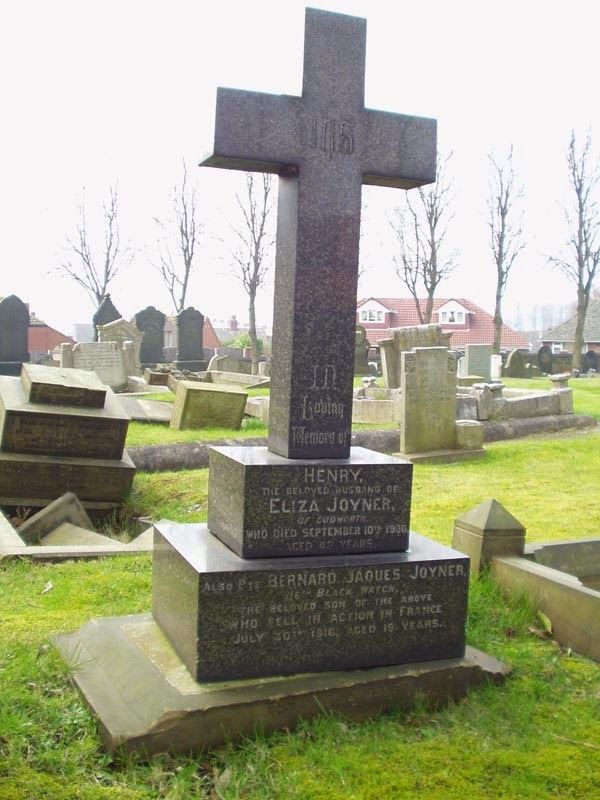 Bernard Jaques Joyner is also remembered on the Joyner family gravestone in the churchyard at Cudworth and on the Cudworth War Memorial. 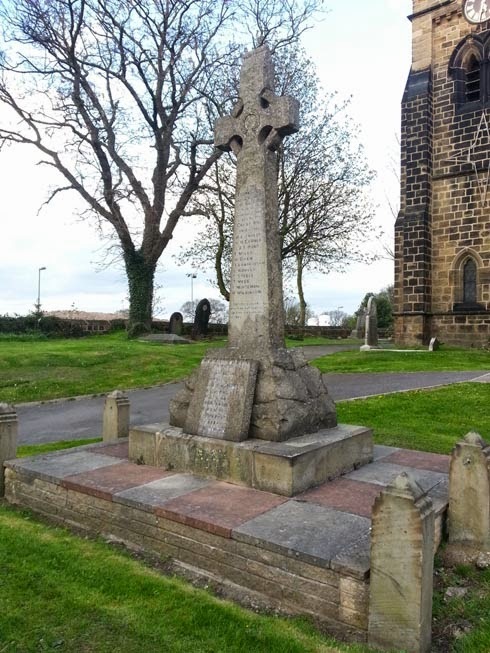 IHS / In / loving / memory of / Henry / the beloved husband of / Eliza Joyner / of Cudworth / who died September 10th 1900 / Aged 42 years / also Pte Bernard Jaques-Joyner / 1/6 Black Watch / the beloved son of the above / who fell in action in France / July 30th 1916 aged 19 years / Thy will be done / also in loving / memory of / Eliza Joyner / the beloved wife of / Henry Joyner who fell asleep Dec 22nd 1924 / aged 64 years / "I will lift up mine eyes unto / the hills. Bernard is remembered on the Theipval Memorial in France and on the Commonwealth War Graves Commission website. 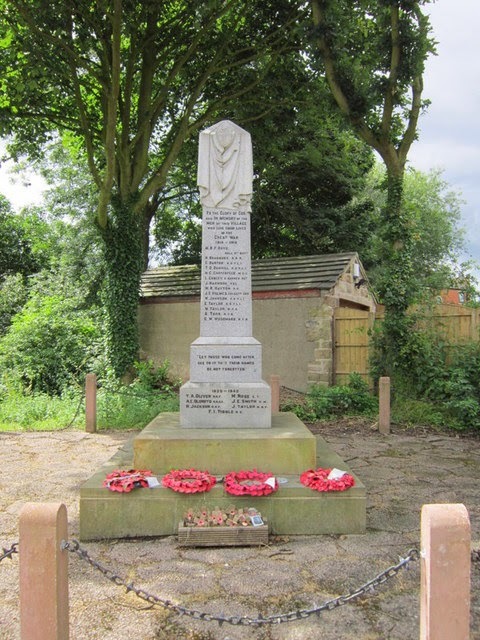 With grateful thanks to Captain Vaughan Bovan of the Barnsley and Wombwell Corps of the Salvation Army for the photograph of the memorial. The building on Wellington Street now stands empty except for the pigeons, and the memorial is in storage in the care of the Salvation Army. 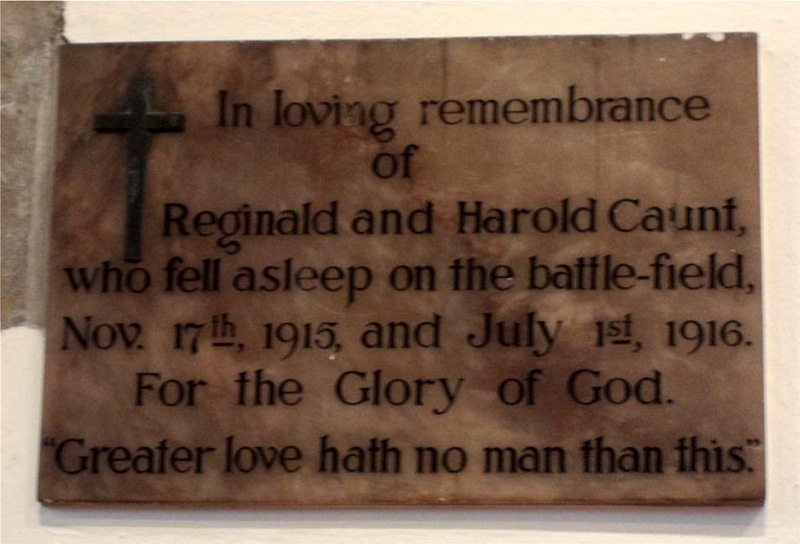 The building where this memorial was erected is now a private swimming baths. 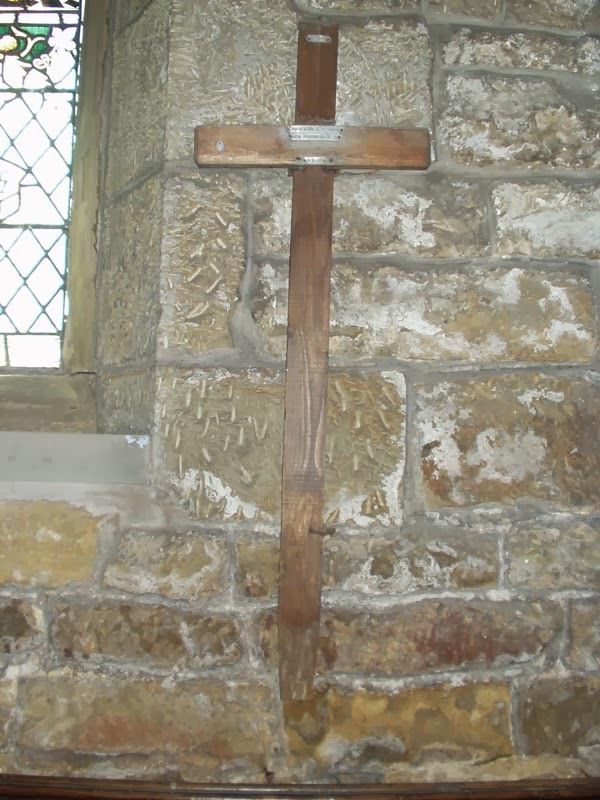 A contact has told us that the memorial tablet was removed to another Methodist Church, however, unfortunately it was broken during subsequent renovations to that church. Research is ongoing to see if a list of names can be found in church records. 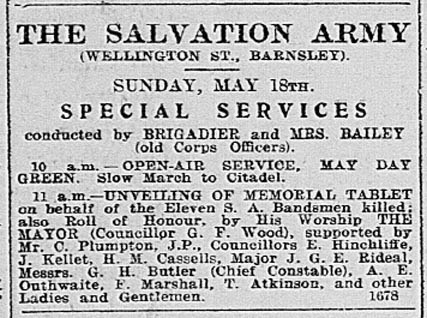 The newspaper cutting from the Barnsley Chronicle on 13 May 1922 notes that 26 men lost their lives out of 116 from the area who served. 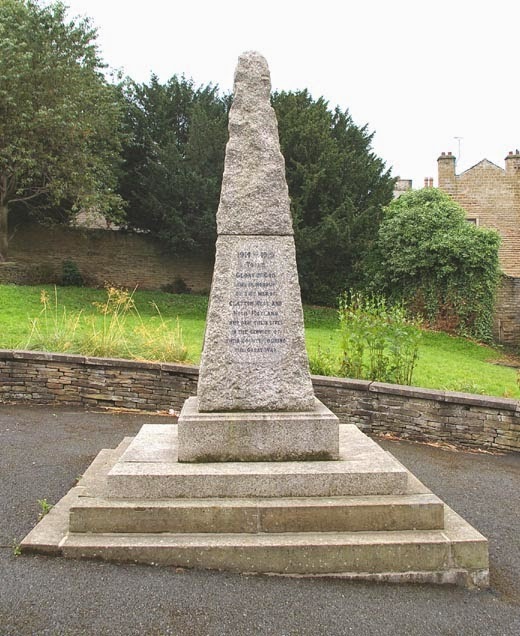 This memorial has been researched in depth and a file of information can be found in Barnsley Archives. Update September 2017: The memorial has been rediscovered, see here for a photograph and full list of names. 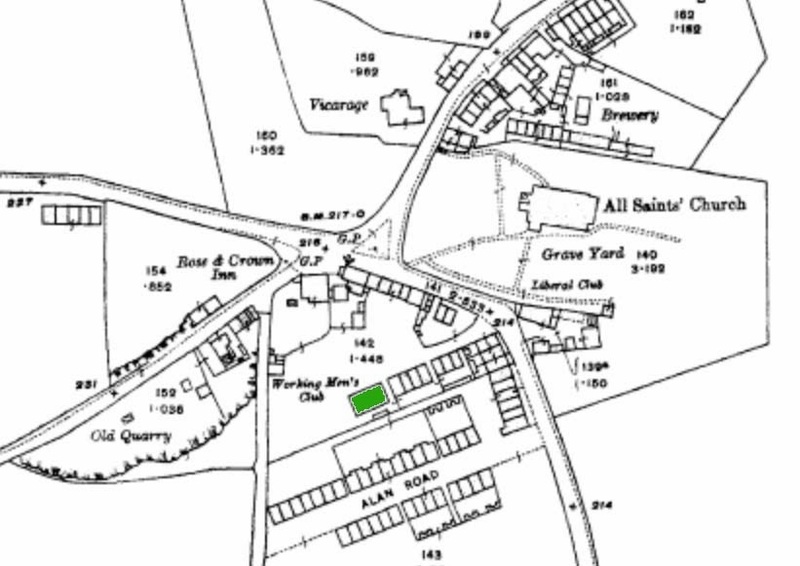 A blog post which investigated and identified the location of the club can be found here. 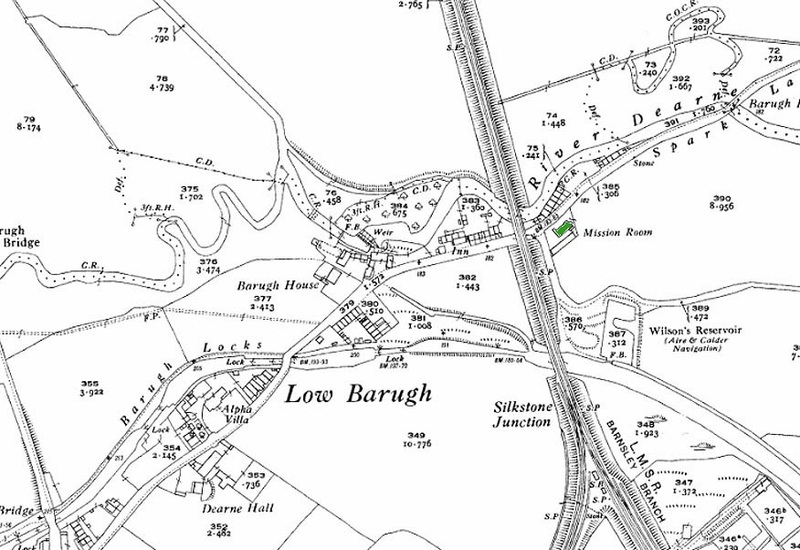 The map snip above shows both locations, on the left the later club, now a nightclub and on the right the club as it was on Market Street where it would have been in 1919. Eight of the members had not returned, two had won the military medal. It sounds very decorative, 'The work on the panel is of a unique character. 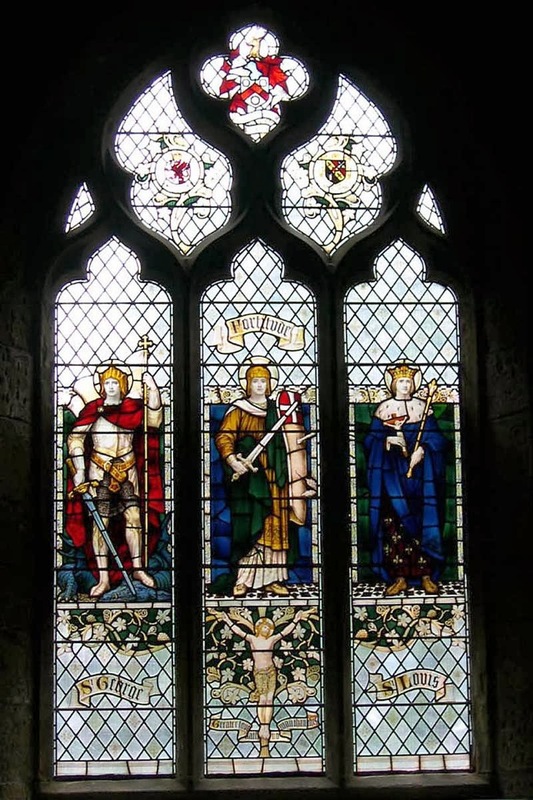 It is of a patented production known as Mosartile, which is prepared after the manner of a stained glass window, by which wonderful colouring effects are secured, yet at the same time the work is imperishable and enduring for all time'. 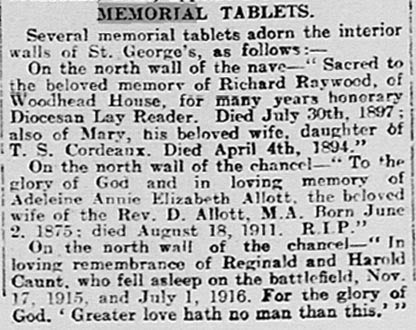 An earlier Roll of Honour, referred to in the article, was reported in the Barnsley Chronicle in January 1918. That RoH listed 86 men of whom 4 had been killed at that date. We see from the 1919 cutting that the final toll was 127 serving and 8 killed. 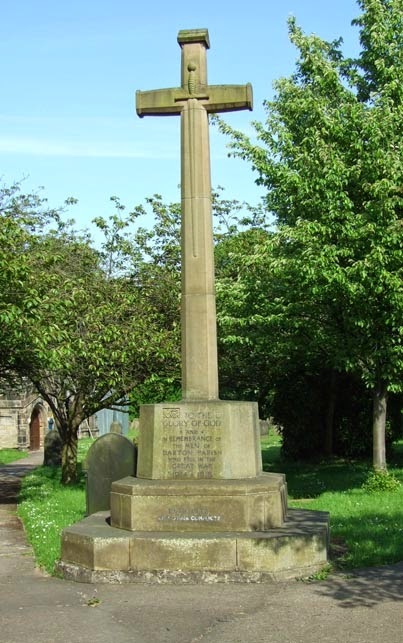 A list of 79 names from the earlier memorial was published in the Barnsley Chronicle on 26 January 1918 and is reproduced here. This newspaper cutting lists 19 men from the firm of Needham Bros and Brown Ltd, of Pontefract Road who have presumably enlisted. It is only the end of 1915 - more could have already volunteered and more will have followed them into service as conscription took effect the following year. Research has yet to be done to discover which of these men returned home and which did not. We do not know if this memorial or any other memorial for the firm still exists. Researched, transcribed and photographed by Peter Marsden and many others who are acknowledged in the Blacker Hill document. A folder containing this information can be found in Barnsley Archives. The memorial was refurbished in 2013 and the black plaque added with extra names for the First World War and the Second World War entry. 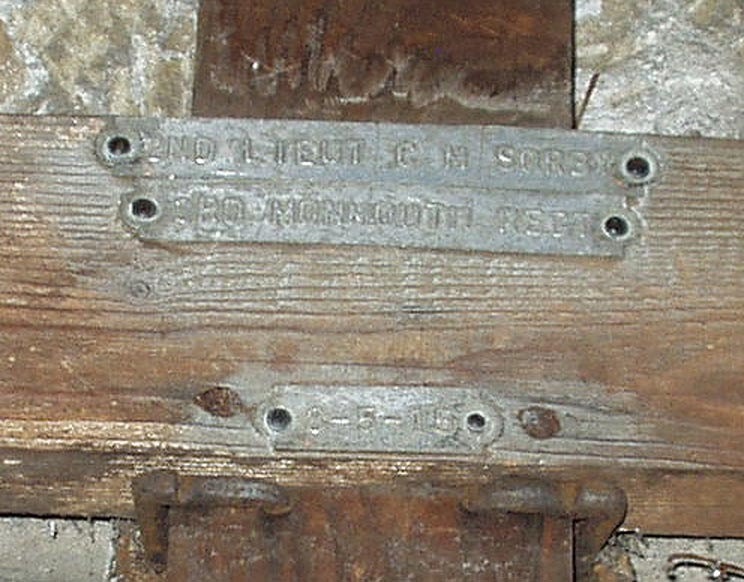 This plaque was originally on display in St Matthew's Mission Church, Low Valley, Darfield. 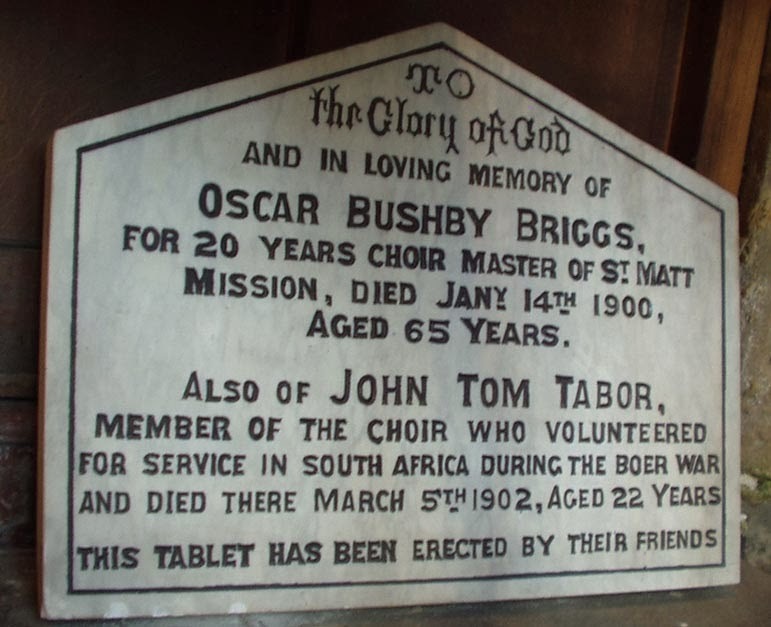 To the Glory of God / and in Loving Memory of / Oscar Bushby Briggs / for 20 years Choir Master of St Matt / Mission, died Jany 14th 1900 / aged 65 years. 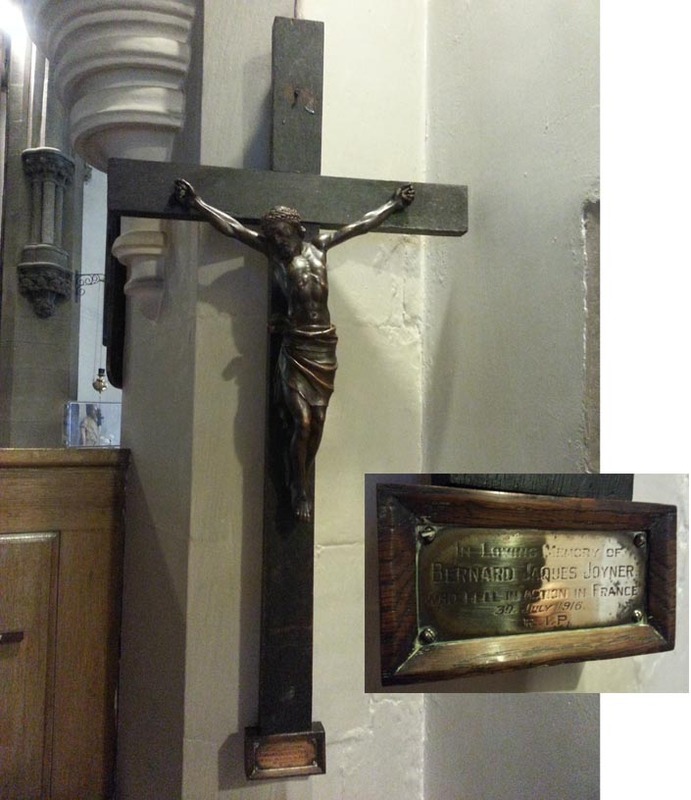 / Also of John Tom Tabor / member of the Choir who volunteered / for service in South Africa during the Boer War / and died there March 5th 1902, aged 22 years / This Tablet has been erected by their Friends. 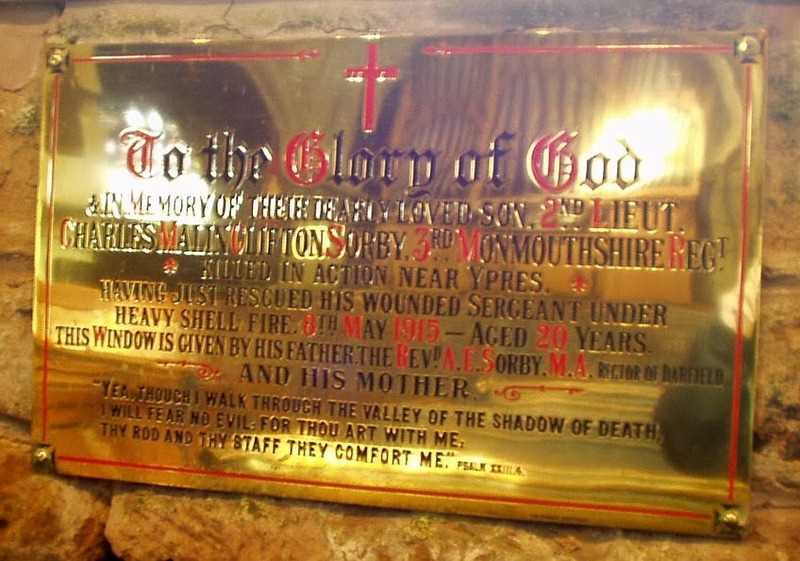 John Tom Tabor is also remembered on a family gravestone in Wombwell Cemetery and on a plaque in St Mary's Church in Wombwell. 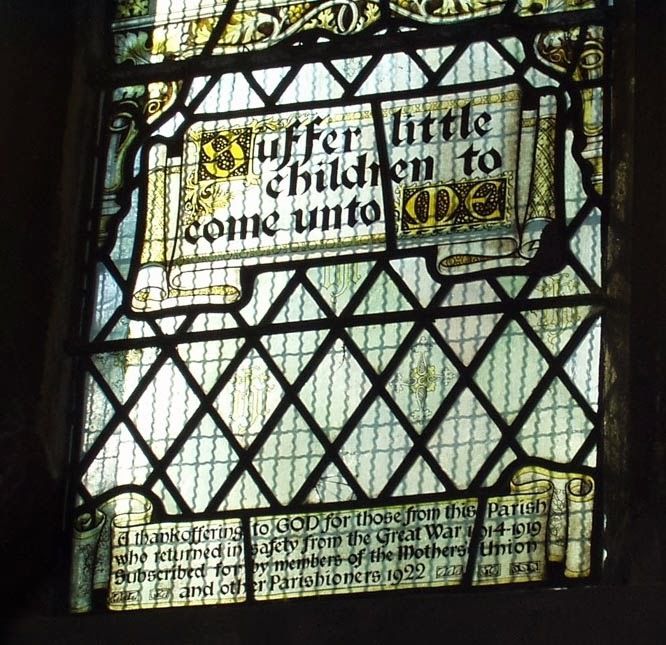 However a church warden, James Dearnley, did include a list of men in his history of All Saint's Church whom he believed should have been included on the memorial. 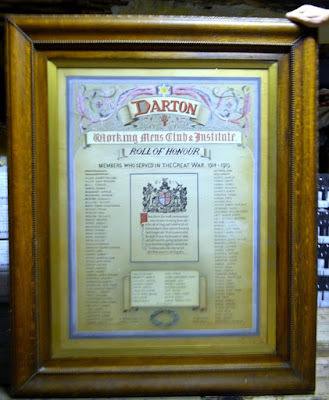 The Working Men's Club on Well's Street produced a Roll of Honour. 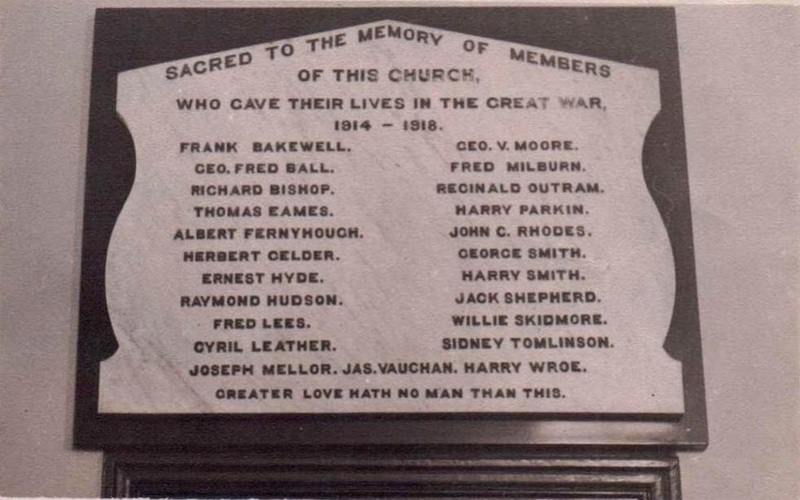 Two mentions of this memorial have now been found - in the Barnsley Chronicle on 11 August 1923, see cutting below, and in a history of All Saints Church, in Darton, by James Dearnley, which can be found in Barnsley Archives. The Darton Working Men's Club & Institute Roll of Honour has been found stored in the Darton Liberal Club, which is indicated on the map above just below the church. It is very impressive, about 4' wide x 5' high in a heavy frame (for scale note the supporting hand at the top right). 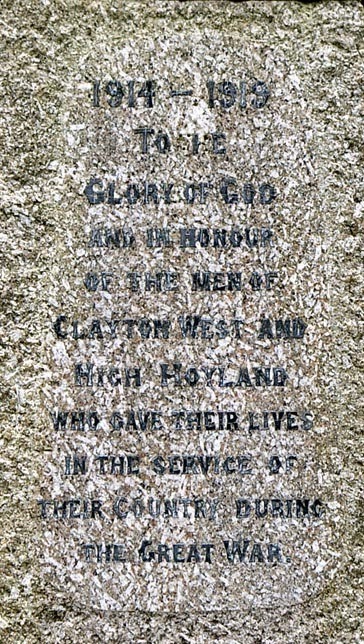 The Fallen men are listed in the scroll below the central panel. The Club are hoping to be able to display it in one of their main rooms in the near future. This list of names is taken from the newspaper cutting shown here.